Munich, September 21, 2017 — Brainlab announced today that it has received FDA clearance for Elements Spine SRS and Elements Cranial SRS, two software applications that aid in the patient-tailored planning of radiosurgery treatments for indications of the spine and brain. 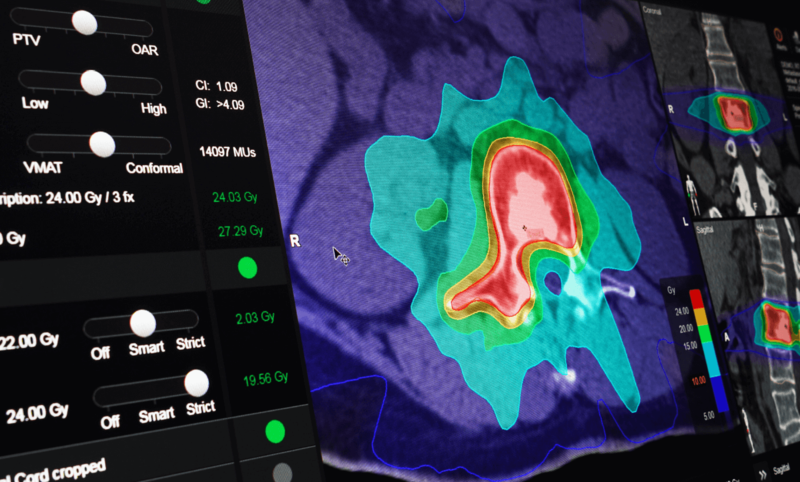 With FDA clearance of these software modules, the Brainlab Elements portfolio of applications that facilitate quick planning, spare organs at risk, and create highly conformal radiation doses in the brain and spine is complete and ready for clinical use in the United States. Brainlab Elements Cranial SRS can create radiosurgery plans in less than 15 minutes from start to finish. The software supports plans for numerous cranial indications, including arteriovenous malformations (AVM), pituitary adenoma, vestibular schwannoma, glioma, meningioma and large brain metastases. A patented integrated 4π algorithm that optimizes beam trajectories, automatically spares surrounding healthy tissue and organs at risk with monitor unit-efficient delivery. Along with the rest of the Brainlab Elements suite, including Multiple Brain Mets SRS, both Cranial and Spine SRS will be available for hands-on demonstrations at this year’s American Society for Radiation Oncology 59th Annual Meeting in San Diego. For more information, visit brainlab.com/astro2017.